Emily with her ‘cello and looping pedals and Felix with his array of percussion instruments and guitar create a unique and dynamic sound. Their music is very much inspired by their love of people, nature, the English countryside and a special affection for Brazil where they both spent many years. When they are not playing their own compositions, they very much enjoy playing arrangements of Brazilian music with it’s richness of melody and dynamism of rhythm. 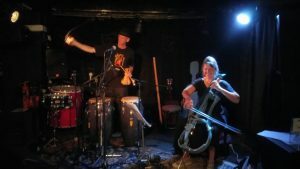 This duo of British musicians who have worked extensively in many genres travelling far and wide with their music, deeply enriched by the process, none the less maintain their origins, bringing to their work a kaleidoscope of fresh musical influences which break new ground between Classical, World and Folk or free Jazz idioms. In performance using modern sampling technology they expand their compositions vertically as well as horizontally creating exciting multi-tracked pieces which spin out a web of intricate harmonies with memorable melodies and embellished by some dazzling displays of improvisation. Their concert program includes an array of completely new works for ‘cello, percussion and guitar and their arrangements of Brazilian Classical and Popular music. The warmth and vitality of the performance reflects that the duo greatly enjoy their creative process. As much in the composition and production of the music as in it’s presentation to the audience it is an enriching and entertaining shared experience. Incandescendo take a new direction and share all the fun that a new journey entails. With their cabaret approach they promise to make you smile and maybe you’ll be driven to dance as they transport you with seductive melodies and toe tapping beats and their own mellow and melodic take on joyful Brazilian music. The music of an Incandescendo score is as much about the visual and sensory nature of these vertical harmonic blocks as the horizontal, melodic narratives that are produced. Emotional memory has a primacy in this process, but there is also a ludic element. The Brazilian approach to popular percussion, like East Indian, Cuban, African, American, Arabic or Asian percussion systems, has been hugely influential in recent years and many of these new dimensions are incorporated into their music. As well as performing their original compositions the Incandesendo catalogue of instrumental music is available by prior permission for syncing to film. Incandescendo is perfect for Festivals, Clubs and Cabaret style events.